It's no wonder Las Vegas wedding favors are huge all year round  with the sheer number of people marrying in Vegas. Those of you who've visited this desert Shangri-la, know that Las Vegas never sleeps. It just parties harder and as for the adage `what goes on in Vegas stays in Vegas'; that means that when past visitors think of Vegas, they do it with a smile  a wee, satisfied, wistful smile. There are gamblers. There are party goers. There are lovers. For some, a perfect Las Vegas wedding favor could be Las Vegas Poker Chips on every table in a Las Vegas themed wedding. For others, who've woken up in a hotel room married to a stranger and a picture of themeselves with Reverend Elvis Presley or Reverend Jimmy Hendrix, perhaps the marriage license is the ultimate Vegas wedding favor. I do kid. My own first impression of Las Vegas, was driving on to `the Strip' and hearing Sinatra booming from the Bellagio Hotel and its amazing dancing fountains. It was as if Frankie's ghost was welcoming us to Vegas with a swagger and full on style. The sheer scale of everything you see on the Strip is amazing and the energy and enthusiasm is non-stop. In the end you leave, vowing to return - to party harder and better! For those travellers and revellers who've sampled Vegas and found love, transferring the fun and madness to their wedding party can be done with Vegas themed wedding favors. What better way to share your Vegas experience with friends and families. Of course, there is the question, how do you get Las Vegas themed wedding favors when you live an ocean away? Where can you buy your Las Vegas poker favors when you live far far away? The fact that you're reading this on Perfect Wedding Day is a powerful clue. You do it online. Do your research in your comfy slippers and bathrobe with your coffee and toast, but remember your Fairy Godmother tip; you can never be too early in organizing your wedding.' Do not wait to the last minute to organise your wedding favors. 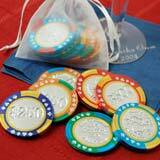 Particularly if you live far from Las Vegas and you are determined to have your wedding favors Las Vegas style. Do it early and relax and enjoy your coffee. Spread a little jam on your toast. A job well done.